Gear box oil reaches extreme temperatures? Have you noticed a leak problem that comes from the transmission oil cooler? Whether it's a bulldozer, an excavator, a wheel excavator, a wheel loader, a compactor, a dumper ... we have what you need! CODIMATRA, specialist in buying and selling used spare parts and public works equipment, has selected for you a complete range of transmission coolers compatible with most existing models. What is the role of the transmission cooler? Once cooled by air the oil comes out of the radiator to return to the gearbox. 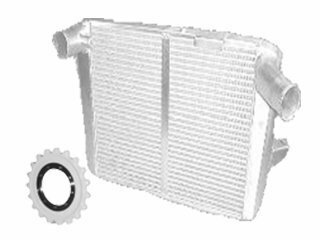 Do not hesitate to replace your transmission cooler! Too often forgotten and yet present in our public works machines the transmission cooler is an important organ. It is necessary to replace the transmission cooler when there are leaks, clogging or shock damage to the fins. Our dedicated list of transmission coolers is updated daily so that each customer can find the product that perfectly matches their machine. To help you choose the model of transmission cooler you need, call on the expertise and professionalism of the CODIMATRA’s teams.They are at your disposal to answer all your questions or for any additional information.